Earlier this month, the California Department of Water Resources put the main spillway of the Oroville Dam to the test for the first time since the crisis over two years ago. 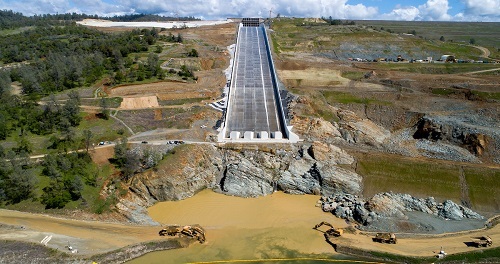 According to the DWR, the spillway performed as designed. The $1.1 billion emergency spillway reconstruction project, which was completed last year, took two years to finish. The winter season brought a combination of heavy rainfall and deep snowpack, resulting in the DWR needing to issue releases in order to manage lake levels. The Oroville spillway failed on Feb. 7, 2017, setting in motion a crisis when heavy rains forced the DWR to release water onto the never-used auxiliary spillway; the earthen auxiliary spillway eroded, threatening the stability of the concrete weir holding back the water of Lake Oroville. The DWR set Nov. 1, 2017, as the initial deadline to get everything back in working order before the next rainy season; as a temporary measure, much of the spillway was filled with roller-compacted concrete. The deadline for the completion of the full reconstruction of the spillways was slated for Nov. 1, 2018, when the last concrete slabs were to be put in place. In August 2018, the DWR noted that a 30-foot-wide section of temporary wall along the Oroville Dam’s upper chute had collapsed, but that it did not impact project deadlines. In November, the DWR reported that the spillway was ready for the winter season. The final erosion-resistant concrete slab had been put in place on the main spillway on Oct. 11; crews placed 378 slabs in 2018, amounting to 612 ERC slabs used total in the repair work. The last ERC wall was placed a week later. Near the two-year anniversary of the disaster, in February, the spillway was rebuilt. Last month, the Trump administration recently announced that it would not reimburse the state of California for much of the repair costs associated with the Oroville Dam incident, citing that the project did not meet eligibility for reimbursement—namely that the structure was poorly built and poorly maintained, rather than the incident being caused by a disaster. The next step, once the spillway gates close, is to have engineers inspect the spillway, as well as continue to monitor instrumentation and share updates with regulators, according to Mellon. Most recently, as of earlier last week, the DWR stopped issuing water releases due to anticipated dry weather. "The Oroville main spillway was rebuilt using modern engineering practices with the oversight of state and federal regulators on site and a team of experts assisting the Department,” said Joel Ledesma, Deputy Director, State Water Project for DWR.